liundred-foot tape corresponding to a considerably smaller distance. This smaller distance is what I have termed an “ intermediate standard.” There is in this latter case the additional operation of finding the number of light waves in the intermediate standard; so that, in reality, there are three distinct processes to be considered. 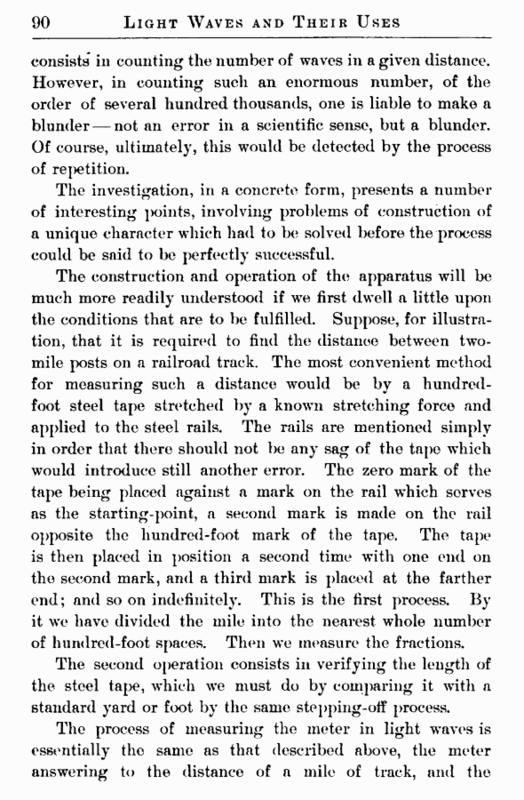 In the first operation it is evident that, if an error is committed whenever we lift the tape and place it down again, the smaller the number of times wTe lift it and place it down, the smaller the total error produced; hence, one of the essential conditions of our apparatus would be to make this small standard as long as possible. The length of the intermediate standard is, however, limited by the distance at wThich wTe can observe interference fringes. The limit, as was stated in the last lecture, is reached when this distance is of the order of several hundred thousand waves. At this distance the interference fringes are rather faint, and it seemed better for such determinations not to make use of the extreme distance, but of such a smaller distance as would insure distinct interference fringes. It was found convenient to use, as the maximum length of the intermediate standard, one decimeter. 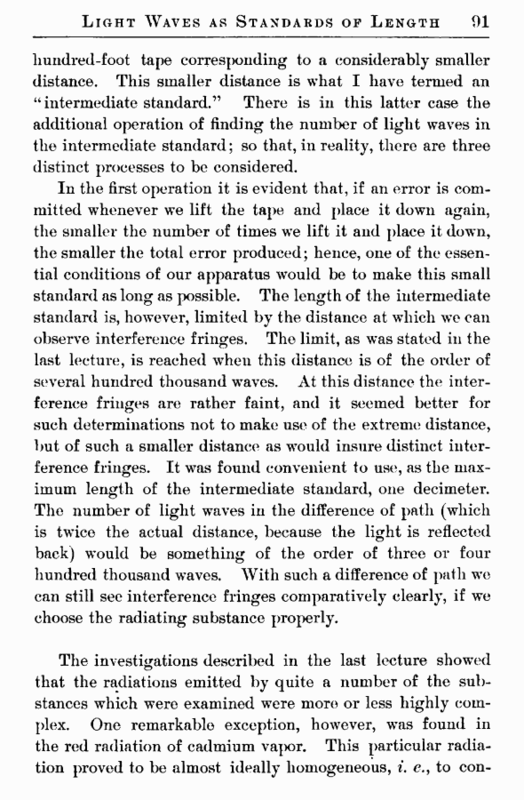 The number of light waves in the difference of path (which is twTice the actual distance, because the light is reflected back) would be something of the order of three or four hundred thousand waves. With such a difference of path we can still see interference fringes comparatively clearly, if we choose the radiating substance properly.